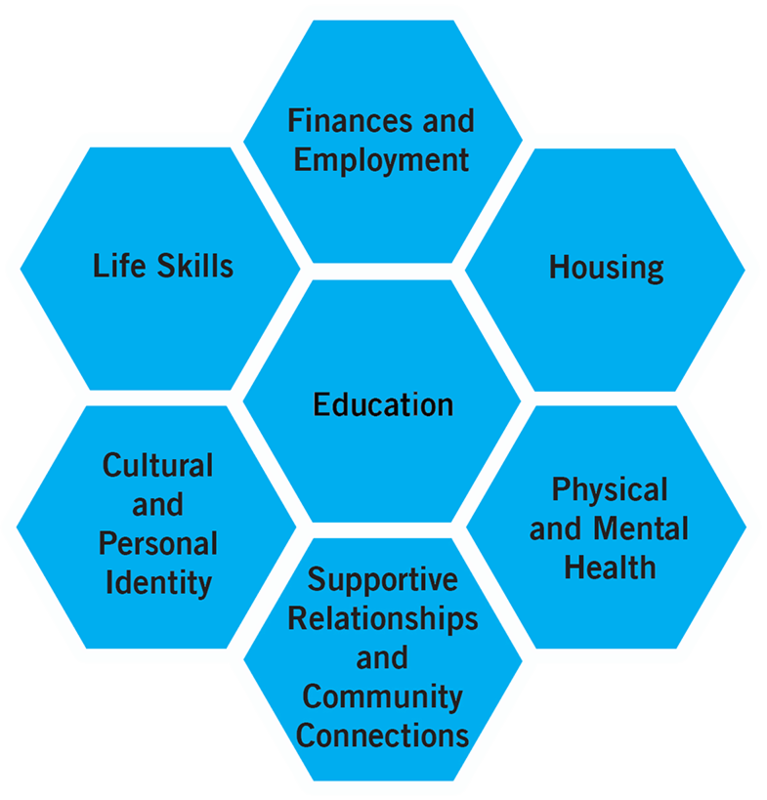 The Seven Life Domains Framework, adapted from the Casey Family Programs "It's My Life" Seven Life Domains (2001), identifies seven areas for potential support that youth with experience in foster care need in order to transition successfully from foster care to adulthood. Concentrating on postsecondary access and success, Western Michigan University's Center for Fostering Success (of which Fostering Success Michigan is a program) has adapted the model and placed education as the central focus. Although each domain is critical in its own way and is interwoven with each other domain, having education in the center visually expresses the support needed in order for a youth with experience in foster care to further his or her education. The framework gives the students, their supportive adults, and professionals an organized way to initiate that support as well as identify existing strengths in the students complex lives (Day, Schmidt, and Unrau, 2017). Day, M., Schmidt, L., Unrau, Y.A. (2017). A framework to approach postsecondary educational program design for college students with lived experience in foster care. Update On Research and Leadership. 28 (1). 2-7. For specific information on each life domain, be sure to check out the toolkits listed below!